How do I check for updates with this new version 2 ? I believe I looked everywhere but do not see an Update icon to click on. How do I check for updates? You don't mention if your are running Free or PREMIUM. In Free, the user must update manually before each scan. In PREMIUM, there are already hourly scheduled update checks -- you can edit those settings, if you wish (my screen shot shows settings that have been changed from the default on my computer). Post back if you need help editing the settings. And, in PREMIUM, you can manually update at any time. 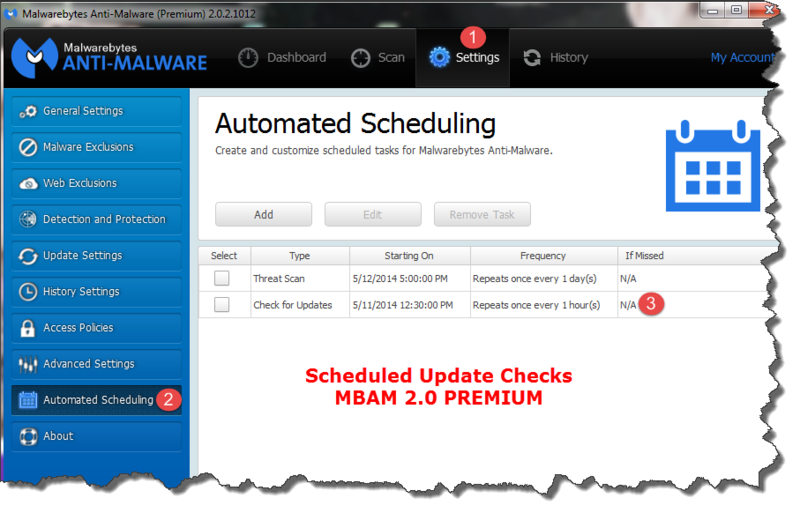 If it's MBAM 2.0 Free, then just click the "Update Now" link in the Dashboard, as shown in the first attached screen shot in my original reply. Thank you. 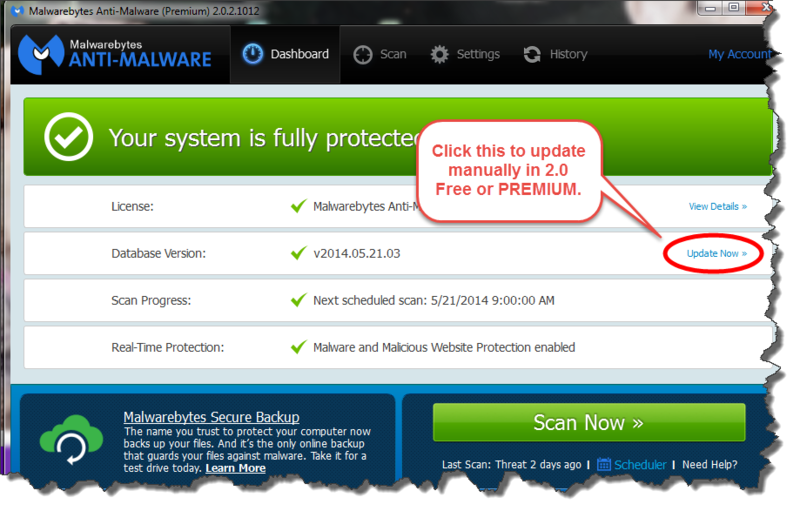 Will anyone be replying to my post regarding the 3 "Trojans" that the new 2.0 MB found and which I have quarantined? I don't know what to do with them and don't know if the are False/Positive, etc. Whether I should leave them in Quarantine or reinstate them, etc. To answer your question, yes, someone will reply as soon as possible. Only the authorized helpers are permitted to reply in that area of the forum. It is quite busy, and many of the helpers are volunteers. So, it can sometimes take 48 hours or so before a helper is available. Please be patient and do not reply to or "bump" that topic until at least 48 hours has passed. Otherwise, it will look as if you are being helped and that could cause further delay. I noitce my request was Posted 20 May 2014 and there were about 40 posts after mine and they all seem to have been answered, but mine was not answered. Or am I confusing something? AFAIK (as just another home user like you), it's not necessarily strictly "first come-first served" -- it's up to the malware helpers as to which topics they pick up when. If a helper has not picked up your topic by sometime later today, then please send a PM to a member of the moderator team and they will look into it. I moved my question of that was Posted on May 20, 2014 up but it still has not been answred when it appears many, many others dated the same date or after have been answered. -What do I do now in order to get an answer? How do I send a PM to a member of the moderator team and they will look into it.